Após o embarque em seu hotel em Aruba, conheça seu guia local e prepare-se para ter uma visão geral abrangente dessa linda ilha tropical. 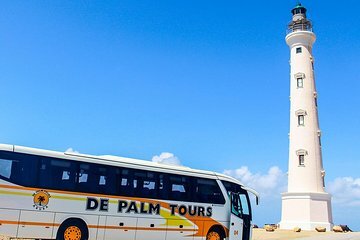 Comece no ponto mais a noroeste da ilha com uma visita ao Farol da Califórnia e termine no canto sudeste da Baby Beach. Pare na formação rochosa Ayo, um conjunto de pedras monolíticas, bem como as históricas ruínas Bushiribana Gold Mill e Capela Alto Vista. Veja o Santuário da Gruta de Lourdes e a famosa Ponte Natural do Bebê. Ao longo do caminho, o seu guia irá ensiná-lo sobre a história e a cultura de Aruba enquanto passa por charmosas casas locais e impressionantes marcos naturais. Quando você chegar a Baby Beach, coloque seu equipamento de snorkel e mergulhe no mar. Flutue entre os belos corais e cardumes de peixes tropicais antes de desfrutar de alguns lanches e bebidas. Depois que sua excursão turística de 5 horas for concluída, retorne ao hotel para fazer o drop-off. This tour was perfect. We saw all the highlights of Aruba while traveling by air conditioned bus. Included was a delicious lunch buffet at DePalm Island and plenty of time for us to explore the stops. A stop at Baby Beach afforded my son an excellent opportunity to snorkel, which he loves. Our tour guide, Ryan, went out of his way to make sure everyone was happy and took pictures of anyone asking. My son thought Ryan was the greatest snorkel guide ever. It was a wonderful day for all ages. We had a great time with a guide and driver who was just wonderful. Trip was informative as well as fun. Baby beach was great and although it was a couples day for us....this is a great place for family fun. I was extremely pleased that I took this tour, I was able to see most of the island from the comfort of the air conditioned bus. We had enough time at each stop. The driver was extremely informative and had a great sense of humor. It was a great way to see the diversity of the island. The only complaint: The empanada at the Natural Bridge stop was very scarce on cheese! The only suggestion: When I signed up for the Half Day Touron the internet prior to arrival in Aruba I was informed it was 4 hours. When I went to get my confirmation ticket, I was told it was over 6 hours.. I was picked up I appreciated this at 9:30am and did not get back to my hotel till 5pm.. This was actually 6.5 hours. While I appreciated all I got to see and do,, I would have wanted to know this was actually a full day tour. I had dinner plans and was more rushed than I wanted to be. Had a very fun day with Ryan. He was very informative and funny. Great tour to see the island. Saw other tours in open air vehicles. We had an air conditioned bus. 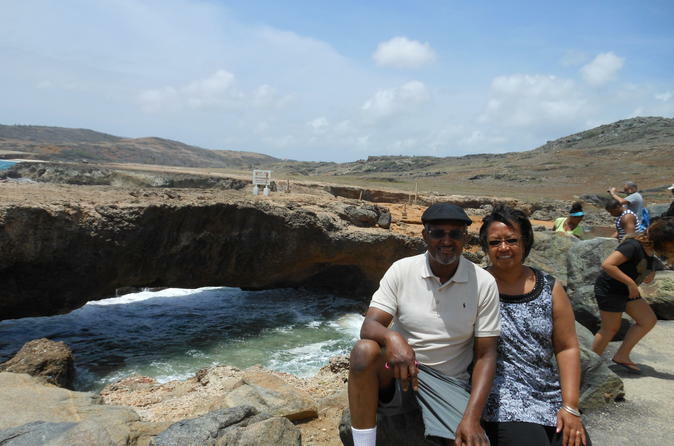 It is hot and dusty in Aruba so take the this tour and stay comfortable. The tour was enjoyable. The bus was clean and comfortable. The tour guide was nice and tried to make jokes throughout. The restaurant stop was not good. The food was fair and soft drinks watered down.The restrooms were dirty and in poor working odor. The jokes were a little weird but the tour and food were great! The Discover Aruba Tour was a very good introduction to the island, and a great activity for the first day there. The trip included a nice lunch and easy snorkeling beach. Our driver, Johan, was very informative and entertaining. I would recommend this overview tour to anyone coming to Aruba for the first time. Very interesting tour got to see most of the Island.Loved all the stops and the tour guide narration was good.I loved getting my temporary Aruba tattoo before the nice Iunch was served.Baby Beach was great.I did not like that the rental price for a chaise lounge was 8.00.But since we were there for only hour I did enjoy the beach .The bathroom fee is 1.00 at Baby Beach. The history of Aruba and all the sites were so interesting.It took about 6 hours.